Johan Christian Claussen Dahl (24 February 1788 – 14 October 1857), often known as J. C. Dahl or I. C. Dahl, was a Norwegian artist who is considered the first great romantic painter in Norway, the founder of the "golden age" of Norwegian painting, and one of the greatest European artists of all time. 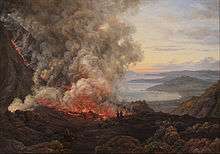 He is often described as "the father of Norwegian landscape painting" and is regarded as the first Norwegian Painter ever to reach a level of artistic accomplishment comparable to that attained by the greatest European artists of his day. He was also the first acquire genuine fame and cultural renown abroad. As one critic has put it, "J.C. Dahl occupies a central position in Norwegian artistic life of the first half of the 19th century. Although Dahl spent much of his life outside of Norway, his love for his country is clear in the motifs he chose for his paintings and in his extraordinary efforts on behalf of Norwegian culture generally. Indeed, if one sets aside his own monumental artistic creations, his other activities on behalf of art, history, and culture would still have guaranteed him a place at the very heart of the artistic and cultural history of Norway. He was, for example, a key figure in the founding of the Norwegian National Gallery and of several other major art institutions in Norway, as well as in the preservation of Norwegian stave churches and the restoration of the Nidaros Cathedral in Trondheim and Håkonshallen in Bergen. Dahl came from a very simple background – his father was a modest fisherman in Bergen, Norway – and he would later look back at his youth with bitterness. He regretted that he never had a "real teacher" in his childhood and, despite all his spectacular success, he believed that if he had been more fortunate in his birth, he would have achieved even more than he had. As a boy, Dahl was educated by a sympathetic mentor at the Bergen Cathedral who at first thought that this bright student would make a good priest, but then, recognizing his remarkably precocious artistic ability, arranged for him to be trained as an artist. From 1803-1809 Dahl studied with the painter Johan Georg Müller, whose workshop was the most important one in Bergen at the time. Still, Dahl looked back on his teacher as having kept him in ignorance in order to exploit him, putting him to work painting theatrical sets, portraits, and views of Bergen and its surroundings. Another mentor, Lyder Sagen, showed the aspiring artist books about art and awakened his interest in historical and patriotic subjects. It was also Sagen who took up a collection that made it possible for Dahl to go to Copenhagen in 1811 to complete his education at the academy there. As important as Dahl's studies at the academy in Copenhagen were his experiences in the surrounding countryside and in the city's art collections. 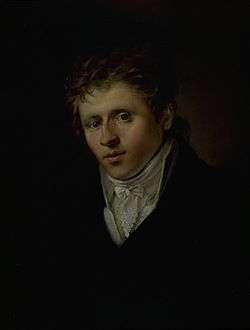 In 1812 he wrote to Sagen that the landscape artists he most wished to emulate were Ruisdahl and Everdingen, and for that reason he was studying “nature above all,” Dahl's artistic program was, then, already in place: he would become a part of the great landscape tradition, but he would also be as faithful as possible to nature itself. Dahl held that a landscape painting should not just depict a specific view, but should also say something about the land's nature and character – the greatness of its past and the life and work of its current inhabitants. The mood was often idyllic, often melancholy. When he added snow to a landscape he painted in the summer, it was not to show the light and colors of snow; it was to use snow as a symbol of death. As one critic has put it, “Unlike the radically Romantic works also appearing at the time, Dahl softens his landscape, introducing elements of genre painting by imbuing it with anecdotal materials: In the background a wisp of smoke rises from a cabin, perhaps the home of the hunter on the snow-covered field.” Thanks to Sagen's recommendations and to his own personal charm, Dahl soon gained access to the leading social circles in Copenhagen. 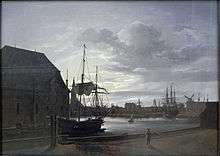 Dahl took part in annual art exhibitions in Copenhagen beginning in 1812, but his real breakthrough came in 1815, when he exhibited no fewer than 13 paintings. Prince Christian Frederik of Denmark, who developed an early interest in Dahl's artistic genius and saw to it that his works were purchased for the royal collection, became a lifelong friend and patron of the artist. Megalithic Tomb in Winter, 1824-25, inspired by the artist's friend, Caspar David Friedrich. In 1816 C. W. Eckersberg returned from abroad with his paintings of Roman settings; Dahl was impressed at once, and they became good friends and exchanged pictures. 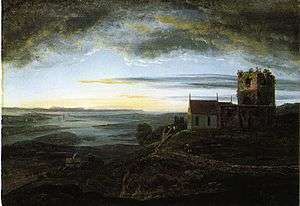 Dahl's 1817 painting “Den Store Kro i Fredensborg” marked the real beginning of his lifelong production of oil paintings depicting natural subjects. After his success in Copenhagen, Dahl realized that he wanted to live as an independent, self-supporting artist. One challenge facing him was that the academic preference of the day was for historical paintings with moral messages. Landscapes were considered the lowest kind of art, and perhaps even not as art at all, but as a purely mechanical imitation of nature. The only landscapes that could be considered art, according to the academy, were ideal, imaginary landscapes in pastoral or heroic styles. In accordance with this reigning taste, Dahl attempted to give his Danish themes a certain atmospheric character in order to lift them up above what was considered a merely commercial level. But at the same time it was his deepest wish to provide a more faithful picture of Norwegian nature than were offered by the old-fashioned, dry paintings of Haas and Lorentzen. This desire was partly motivated by homesickness and patriotism, but it was also suited to the public taste of the day for “picturesque” works. Together with Friedrich and Carl Gustav Carus, Dahl would become one of the Dresden painters of the period who exerted a decisive influence on German Romantic painting. 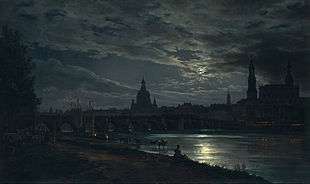 In Dresden, as in Copenhagen, Dahl traveled around the area to draw subjects that could be of use to him in larger works that would be painted later in his atelier. He wrote to Prince Christian Frederik in 1818 that “most of all I am representing nature in all its freedom and wildness.” Dahl found enough material in the Dresden area to supply motifs for his paintings, but he continued to paint imaginary landscapes with forests, mountains, and waterfalls. 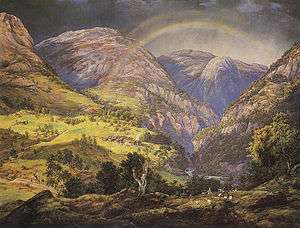 One such painting, completed in 1819, entitled “Norsk fjellandskap med elv” (Mountainous Norwegian landscape with river”), garnered great attention among younger artists who considered the striking natural quality of the painting a breath of fresh air on Dresden's stagnant art scene. Another monumental waterfall painting, completed the next year, was lavished with praised by the critic for Kunstblatt who said that Dahl was greater than Jacob van Ruisdael. Dahl was accepted into the Dresden academy in 1820. Prince Christian Frederik wrote to Dahl in 1820 from Italy and invited him to join him at the Gulf of Naples. Dahl was at the time courting a young woman named Emilie von Bloch, but felt he should take the prince up on his offer, so he married Emilie quickly and traveled to Italy the next day. He ended up spending 10 months in Italy. Though he missed his bride, the sojourn was a decisive factor in his artistic development. It was in Italy, with its strong southern light, that Dahl's art truly flowered. It forced him to see nature plain, without the mediation of the old masters' renderings of light and color. Dahl went to Rome in February 1821. He spent a great deal of time visiting museums, meeting other artists, and painting pictures to sell. In addition to painting sights in Rome and pictures of the Gulf of Naples, he painted landscapes inspired by the mountains of Norway. Dahl said that not until he was in Rome did he truly appreciate Norwegian nature. In June 1821 Dahl returned north to Emilie and a quiet life of family and painting. Dahl quickly became a member of Dresden's leading circles of poets, artists, and scientists, among them the archeologist C. A. Böttiger, publisher of Artistisches Notizenblatt, who ran a major article on Dahl in 1822. Dahl never formed a “school” around himself, but rather preferred for his students to cultivate their own styles; it was against his principles and his respect for artistic freedom to try to inhibit his students' individuality. It was this impulse toward individuality that later caused him to turn down an offer of a permanent chair at the academy – he didn't want to feel compelled to show up for class when he was busy working on a painting. As Dahl wrote in 1828 to the director of the Dresden academy, he found the area around Dresden useful for nature studies, but the “real thing” was always missing; that was something he could only find in his mountainous homeland. He viewed himself as a “more Nordic painter” with a “love for seacoasts, mountains, waterfalls, sailboats, and pictures of the sea in daylight and moonlight.” He longed to return to Norway, but not until 1826 was he able to make a journey home. In 1827 Emilie Dahl died in childbirth while having their fourth child, and two years later two of the older children died of scarlet fever. In January 1830 Dahl married his student Amalie von Bassewitz, but she, too, died in childbirth in December of that same year. Dahl was crushed, and many months passed before he was able to paint again. Some years later this youngest child also died, leaving Dahl with two surviving children, Caroline and Siegwald. Dahl's trip to Norway in 1850 would be his last. He was aging and weak, but continued to paint landscapes in the mountains. This last journey to his homeland resulted in several magnificent works, including Måbødalen, Fra Stugunøset, and Hjelle i Valdres. Dahl was also among the founding fathers of the National Gallery of Norway (Norwegian: Nasjonalgalleriet), now the National Museum of Art, Architecture and Design, and donated his own art collection to the institution. Together with Johan Sebastian Welhaven, Frederik Stang and Henrik Heftye, he also founded the Art Society in Oslo (Oslo Kunstforening). Dahl died lonely and bitter after a brief illness and was buried on 17 October 1857 in Dresden. In 1902, a statue of Dahl by Norwegian sculptor Ambrosia Tønnesen (1859-1948), was erected on the facade of the Vestlandske kunstindustrimuseum in Bergen. In 1934, his remains brought back to Norway and buried in the cemetery of St. Jacob's Church (Sankt Jakob kirke) in Bergen. J.C. Dahl occupies a central position in Norwegian artistic life of the first half of the 19th century. His Romantic yet naturalistic interpretations of Norwegian scenery were greatly admired in Norway as well as on the European continent, particularly in Denmark and Germany. His place in the pantheon of European artists is secure and his influence on the course of art history is indelible. Dahl had both the Orders of Vasa and St. Olav bestowed on him by the King of Norway and Sweden. He also received the Order of Dannebrog from Denmark. The three honors testify to his extraordinary cultural impact throughout Scandinavia. 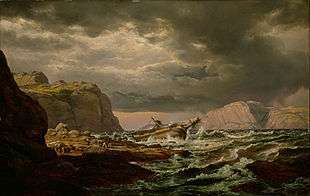 Many of his works may be seen in Dresden, notably a large picture titled Norway and Storm at Sea. The Bergen Kunstmuseum in Bergen, Norway, contains several of his more prominent works, including Måbødalen (1851), Fra Stedje i Sogn (1836), Hjelle i Valdres (1850), Lysekloster (1827), Stedje i Sogn (1836) and Bjerk i storm (1849). ↑ "I.C. Dahl". Online Database. NRK. Retrieved 2012-02-17. 1 2 3 4 5 6 Bang, Marie. 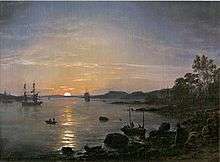 "Johan Christian Dahl". Online Database. SNL. Retrieved 2012-02-17. 1 2 "Johan Christian Dahl". Synopsis. The Art of the Landscape blog. Retrieved 2012-02-17. ↑ Lederbelle, Thomas. "Johan Christian Dahl (1788- 1857) Winter Landscape. 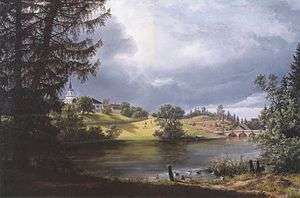 Near Vordinburg 1827". Online Article. Statens Museum. Retrieved 2012-02-17. 1 2 3 4 5 6 King, Averil. 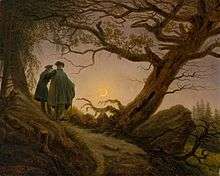 "Moonrise over Europe JC Dahl and Romantic Landscape". 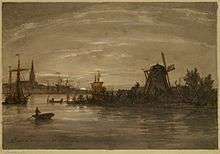 ↑ "Johan Christian Dahl". Store norske leksikon. ↑ "A Mirror of Nature: Nordic Landscape Painting 1840-1910". artsmia.org. This article incorporates text from a publication now in the public domain: Chisholm, Hugh, ed. (1911). 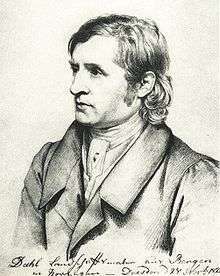 "Dahl, Johann Christian". Encyclopædia Britannica. 7 (11th ed.). Cambridge University Press. p. 731. Wikimedia Commons has media related to Johan Christian Claussen Dahl.